We all want to know how much our web site or web app is worth. And there is no straight answer to this seemingly simple question. There are few online marketplaces for trading web sites and apps like Flippa or Web Site Broker where you can check similar projects to yours going on sale and watch the numbers for how much they are being acquired. But even in such marketplaces there are no golden rules on how to calculate actual value, it mostly depends on individual site, being in the right place at the right time and finding the buyer who does see great potential in your project. So we at Enfew decided to put together a list of posts, tutorials and tools for evaluating the value for web projects. Hopefully after going through this list you will be more sure on how much your web site or web application is worth. And let us know if you have some special way for value calculation. We will add it to the list. Lets calculate! Extensive post written by Daniele Bazzano has a nice list of online tools available for evaluation of web project value. He has a short summary about each tool, how they work and what metrics are being used for evaluation. 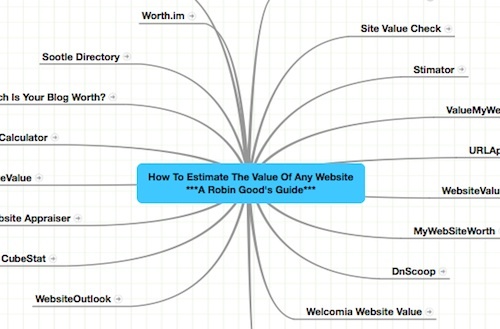 But even while listing all the online tools author recognizes that estimated values you get back from all of them differ a lot. And annual site revenue for at least last 2 years together with inbound traffic are one of the key factors. Guys from College Startup have put together a list of factors you should evaluate your web projects with. This list was created at the end of 2006 but most of factors are still very relevant today. Daily unique visitors, average daily profit and content quality being some the top factors for estimation. Website Valuations – How Much Is Your Site Worth? One the biggest marketplaces for trading web projects Flippa have their take on web project evaluations as well. In the last years blog post they have outlined what factors are most used to evaluate web sites and introduced Flippa website evaluation tool to automate the evaluation process. This tool has created many discussions online about its accuracy, but most users do admit that it works more precise than others out there. As Flippas Andrew Knibbe admits in mentioned blog post, only easy answer to website evaluation is whatever market is willing to pay for it. David Glass has created post with list of 5 methods to best evaluate value of your site and published it as guest post on Flippa blog. Comparable sales, revenue multiple and traffic value are among the methods he mentions. Warriorforum.com is well known online forum where lots of internet marketing pros hang out. It has many threads related to value of web projects and web sites and it always is interesting to check the comments by online marketing professionals while evaluating your online project. We created the link which will show you Google’s results this specific question on just warriorforum site. Enjoy reading. The Next Web also did an article about finding the value of web projects and what are the main points to look at. They have even called it science. Well even if its not the science yet I’m sure that after reading all the methods and tutorials we have on this list you’ll see that its not a very simple process. And as all business its a lot about being in right place at right time!